The founder and CEO of Amazon.com, Jeff Bezos, one of the digital billionaire has decided to buy Washington Post for $250 million in cash. 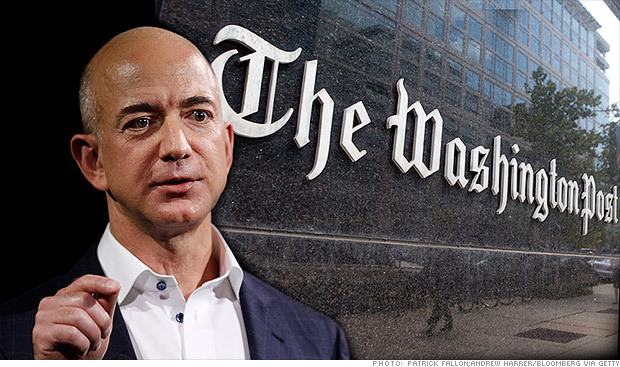 This is an individual deal between Jeff Bezos and Washington Post. According to the Amazon company statement, Amazon.com is not a part of this deal and has nothing to do with the self interest of its CEO. The Washington Post was founded over 125 years ago and with the purchase of Washington Post, will the saga of 125 years old journalistic will come to an end or not can only be confirmed what Jeff Bezos and Washington Post's current team think of. Will the current editors, general manager or CEO continue to work under the flagship of Jeff or will they go to some other top US or international newspaper agency on time will tell?